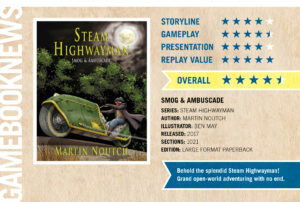 Steam Highwayman has now hit 150% funding over on Kickstarter and although the recent few days have seen fewer new backers, it’s still very encouraging to hear from keen gamebook and steampunk fans from all over the world. Recently, Thailand appeared on my radar! I’ve had a few days working on more mundane things, including laying a friend’s lawn, but I’ve also been preparing a parallel mini-project that I hope will attract even more backers. I’ll be moving into a new social media platform as well as making more of Smog and Ambuscade available to, er, read… So watch out for another announcement tomorrow!